Semarang, September 12th 2013 – Hotel NEO Candi Semarang was officially soft opened on September 4, 2013. 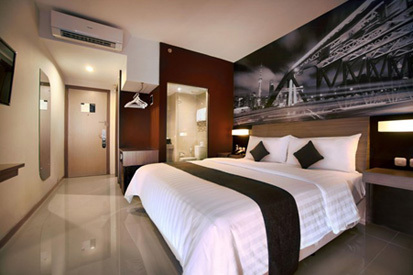 The non-smoking Hotel NEO Candi Semarang is Semarang's only designers select service hotel with 105 guest rooms, 3 meeting rooms and a ballroom. Sitting in an ideal location on Jalan S. Parman at the very heart of Semarang, the new NEO lends itself as a base for business travelers and tourists alike, with a convenient address just 15 minutes from Semarang’s Tawang Train Station and 10 minutes to Lawang Sewu and Kota Lama Historical Building. Hotel facilities on offer raise the bar for budget hotels, boasting such comforts and conveniences as a “Noodles Now” Restaurant which focuses on freshly made authentic noodle dishes, ample onsite parking, a mini market and retail shops, as well as stylish meeting rooms intended for more intimate corporate affairs. 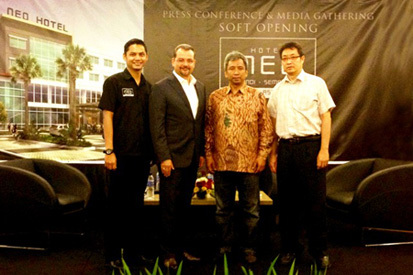 Soft Opening Hotel Neo Candi Semarang, seen in the picture from left to right Mr. Martheas Mulyawan – Hotel Manager NEO Candi Semarang, Mr. Norbert Vas - VP Sales & Marketing Archipelago International, Mr. Ir. Soepartono - Director PT. Lingga Jati Kemiko and Mr. Agus Setiawan – Contractor during the Press Conference.